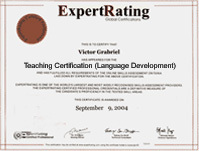 (leading to ExpertRating Teaching Certification-Language Development). 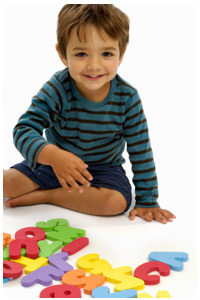 Follow your child's lead and have fun while enhancing language development! In this fun and user-friendly course for parents, teachers, and caregivers, you will discover how children learn to process language and how they become proficient speakers and thinkers. This course will help you enrich your child's life by stimulating his or her continued speech, brain, and language development in an enjoyable, age-appropriate, and natural way. About the ExpertRating Online Teaching Course (Language Development) instructor : After receiving a Bachelor’s degree in Child Development with high honors, Kt Paxton completed a fifth year of study and holds a California Teaching Credential. She managed a pre-school and has more than a decade of experience teaching elementary schoolchildren. Kt is also the published author of the book "More Adventures With Kids in San Diego." Enhancing Language Development in Childhood Course requirements: For taking this instructor led ExpertRating Online Teaching Course (Language Development) you need Internet access, e-mail, and the Microsoft Internet Explorer or Mozilla Firefox Web browser. "A good course. I loved how the instructor kept emphasizing that we do not need paper and pencil activities to create language enhancing opportunities with young children." "An invaluable course. More Helping Professionals should be made aware of it." "As a parent of a child with a speech delay and a child care provider I thought the course was terrific! The instructor provided excellent material to use for all levels of speech development. She provided the development "basics" as well as information to enhance speech from infancy on." 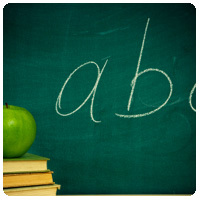 "As a preschool teacher, I found this course to be very informative and educational. I know that it will help me in my everyday interactions with my students." "Excellent course! Please try to advertise more specifically to parents concerned with speech & language development. As one of those parents, I wish I had found this course sooner. Many thanks!" "Extremely rewarding information and on-line ease. My knowledge has expanded and my family life did not suffer. Thank You." "Great class! Ms. Paxton is very knowledgeable and I learned a lot!" "Great class! This is the 2nd one I have taken with Kt. I enjoy her a lot!" "Great course! This was my first online course. Positive experience!" "Hello Kt, This course & your Ready, Set, Read! course are fantastic. I cannot say enough good words about you & how you are teaching us. Each lesson builds & enhances what we are learning. I am going to recommend these classes to other teachers & providers! Very worthwhile. Thank you so much!" "I am a Home Visitor who works with 2-3 yr. olds. Some parents have voiced concerns about their child's speech and language. I would usually comment that the baby babble is normal, but after taking this course I have more knowledge and some information to back it up. Thank you very much for a very enjoyable course." "I could tell the professor really cared about what she was teaching and her personal experiences helped create a deeper understanding. Excellent course - all new mothers/teachers should take this." "I enjoyed the class and had a good first online class experience. I learned a lot. Thank you!" "I enjoyed this class. I learned so much!!! Thanks." "I enjoyed this course and feel that I learned a lot! I work with children, ages 1-3 years and some with speech delays. It will be very helpful! Thank You, Barbara"
ExpertRating is one of the world's only ISO 9001:2015 Certified companies (from TUV America) offering an Online Teaching (Language Development) Course (leading to ExpertRating Teaching (Language Development) Skills Certification). When you choose the ExpertRating Online Teaching Course (Language Development) you can be sure that you are buying a premium International certification that is recognized by hundreds of employers and Government bodies in the US and other countries. With ExpertRating you get certified quickly online and you are equipped with a store house of information through the in-depth ExpertRating Online Teaching Course (Language Development) Courseware which has been developed by experienced Education Experts. You can buy this ExpertRating Online Teaching Course (Language Development) leading to Teaching certification at a special offer price of only $129.99 which includes the in-depth ExpertRating Online Teaching Course (Language Development) Courseware and exam fee. This is the best value for money Teaching Program available till date. You get the following services within the USD $129.99 fee. In-depth ExpertRating Online Teaching Course (Language Development) Courseware including scenarios and case studies. The process of getting yourself certified is very simple. All you have to do is buy the ExpertRating Online Teaching Course (Language Development) for $129.99. Log in to the instructor led course using your password. Go through the ExpertRating Online Teaching Course (Language Development) Courseware (which would take you 6 weeks) and complete the final Teaching Certification exam at your convenience. You can complete the exam within 2 months of buying the Teaching Certification. The result of the exam appears as soon as it is completed, and your Teaching Certificate is mailed immediately. The final exam is fully based upon the ExpertRating Online Teaching Course (Language Development) Courseware that is provided along with the Teaching Certification. If you have gone through the courseware properly you should not have a problem clearing the exam. The exam consists of multiple choice questions from all chapters of the ExpertRating Online Teaching Course (Language Development) Courseware. The Enhancing Language Development in Childhood course is a tool to support teachers’ use of language facilitation strategies. Language is a powerful tool which helps to form our thoughts and reactions and which facilitates communication. 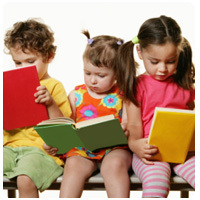 Children learn the fundamentals of language in their home, in school and from their peers. 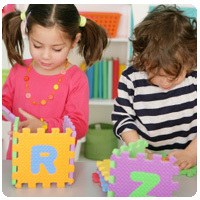 Language development in children is important to help them organize their ideas and build symbols. Children come to understand and communicate language during early childhood and this valuable course will guide you on how to enhance the process of language development. Parents and teachers can help sustain natural language development by providing environments full of language development opportunities. The ExpertRating Enhancing Language Development in Childhood Certification course will be useful for parents, teachers and leaders who want to hone the language development skills of the children. How do children learn language? Play! And not with flash cards, or anything else that you can buy. Children are born with a complete package of language-learning tools. The only accessory they need is you, helping them unlock their natural instincts for language. After reading this first section, you'll be using play and instinct to communicate soundlessly with a newborn, to help him fill his language-building toolbox, and to create a stimulating environment for language development. Imagine a database of sounds in your child’s brain. Where do these sounds come from? How does she file, sort, and choose to use these sounds to communicate? This lesson will look at why her mind is made for these remarkable tasks, and you'll learn straightforward ways you can lend a hand (even in the form of sign language!). This lesson also includes a fascinating overview of brain and mouth anatomy. You say, “Shelly just said, ‘ball’!” But your friend says, “Nah, that was just babbling.” Who's right? Does something count as a real word if it isn’t pronounced perfectly? This lesson will explore what makes a word real and how to interpret your child’s patterns of simplifying early language. You'll also start using a journal to uncover the rich potential in your child’s one- and two-word phrases. Once you understand the mechanics of hearing and understanding, your role in encouraging language can be powerful, simple, and fun! Many caregivers ask at this stage when they should start to worry about language delays. This lesson will soothe your concerns by discussing what to watch for, when to seek assistance (and from which type of specialist), and when to stop worrying and keep playing! This lesson will look through a list of typical first words that you can use to trace your child’s communication explosion. Can you guess when a baby’s brain grows the most? How do you facilitate this growth? Again, the answer is play! In this lesson you'll match favorite infant-caregiver games to the neurological functions they stimulate. You'll also learn how language affects the development of thinking skills, just as the function of thinking affects language development. In this lesson you'll explore how to keep this circle of growth cycling. Your kiddo is talking, but you’re not done yet! Although two-word phrases, such as “get ball” certainly communicate an idea, your child will keep refining his sentences as he grows. In this lesson you'll find out how to help him progress to past tense, contractions, pronouns, and conjunctions. You'll also learn about the fascinating thought processes behind questions. Don’t forget your journal! Wow–now you have listening, speaking, sounds, words, and sentences. What more is there? Lots! Is it still fun? Does she still need you? Of course! This lesson will continue with a few more do's and don'ts for caregivers, emphasizing a favorite learning tool: games! Expanding on the earlier anatomy lesson, in this lesson you'll learn how sounds depend on strong, agile mouth muscles. Before you start thinking about tongue push-ups, remember one always focus on maximizing the opportunities within natural interactions. A discussion of feeding—including your choices of bottles, cups, and straws—is key. This lesson will answer complex and controversial questions about pacifiers, sippy cups, and thumb sucking, and will provide some great tips for easing necessary transitions. Some sounds sound fun (like boing! ), and some sounds feel fun (like zzzzzz). What does this kind of fun teach if it doesn't use precise words? In this lesson, you'll find out what you're teaching when you encourage your little one to play with sounds. You'll also learn which speech games will help you make the connection from speech to reading. Now you know that speech, language, and communication are different, but related, topics. Using your knowledge of how sounds make language, in this lesson, you'll learn how language is used to communicate and connect with others. It is called social use of language. In this lesson you'll also learn how to help your talker become a conversationalist! Although children follow similar development processes, no two walk the same path. As more is discovered about learning, the lines between different, delayed, and disability grow foggier. Demystifying these terms is easier when you learn about different learning styles, and when you understand the styles used by you and your child. While you can’t eavesdrop on your child’s thoughts, what you learn in this lesson will help you help her connect her learning style and her use of language. 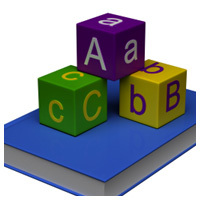 Teaching a child the alphabet tends to be the first step toward reading, but is it where literacy begins? 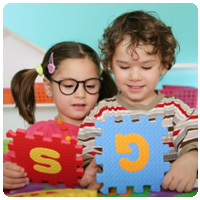 While this skill can be gratifying for adults to see, literacy begins in the brain and is nurtured with fun and games. As you've learned about language skills, literacy doesn’t come in a box from the store. When you understand instincts and use them in fun and play, they come from you.